Since Material design was introduced, the Floating Action Button (FAB) has become one of the simplest components to implement, becoming a fast and essential favorite amongst designers and developers. In this tutorial I will show you how to make your apps FAB interactive and how to make your own animations. But let’s start simple, adding the Floating Action Button to an Android project. Floating action buttons can be one of two sizes. The default (56dp) and mini (40dp). For further discussion on the design principles of using a FAB, I recommend you read Google’s official guidelines. 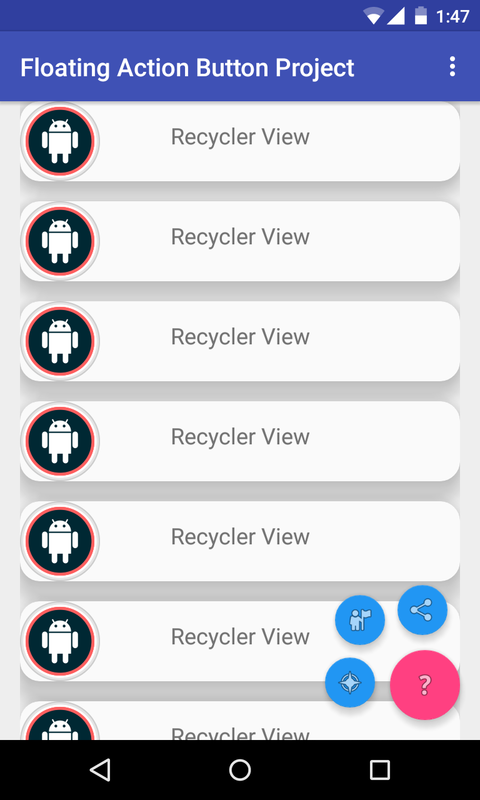 To show this animation I created a recyclerView so the FAB can react to scrolling. I’m using the FloatingActionButton.Behavior() class which according to the official documentation, its main function is to move FloatingActionButton views so that any displayed Snackbars do not cover them. But in our case this class is extended so that we can implement our own behavior. Let’s get into more detail about this behavior class. Its intention is that whenever a scroll is initiated, the onStartNestedScroll() method will return true if the scroll is vertical and from there the onNestedScroll() method will hide or show the Floating Action Button, depending on its current visibility status. The same logic as previously is applied, only the way the FAB hides changes. The animation is simple. The FAB floats off the screen vertically using a LinearInterpolator. The FAB floats a distance down calculated by its height plus bottom margin to remove it completely of the screen and is floated back to its original position on scroll up. If you take a closer look at the code, I removed the View.VISIBLE and the View.GONE checks in the if statements because the view doesn’t hide in this case, just floats off screen. Now you have an idea of what we’re making, let’s start building. The first step into building this menu is the layout containing the 3 small buttons. All the small buttons are invisible and are located at the bottom of the layout, under the primary FAB. Include this layout in the activity’s layout, under the primary FAB. Now that the layout is set, the next step is making the animations to show and hide each of the small FABs. While creating these animations I encountered the issue of touch events and small FABs. When the animation finishes the actual position of the small FABs does not change, only the view appears in the new position so you can’t actually perform touch events on the correct position. What I did to fix this issue was to set the layout parameters of each FAB to its new location and then perform the animation of pulling the view to the new position. In the rest of this tutorial I will show the process of animating one of the small FABs. The process is the same for the others but with different relocation parameters. Here I relocate fab1 by adding right and bottom margins to its layoutParams and starting the animation. The process of hiding is the reverse of the previous animation. Now all that remains are the animations. Inside the res/anim/ folder I created files for all the animations. There’s not much to these, but if you need help understanding what each tag or attribute does, read the official documentation. Finally, if you look at the translate tag, responsible for moving the view, the factor by which I have relocated the FAB (170% and 25%) correspond to the factors with the margins are added and subtracted in the java code. The same process applies to both the other FABs, but with relocation factors of (150% and 150%) fab2 and (25% and 170%) fab3. If you are looking to make some special animation with FABs you can make use of the ViewAnimationUtils class to make reveal animations on views. The rest of this article will be focused specifically on this class and how to build reveal animations with it. Unfortunately, this class is only available for API versions 21 (LOLLIPOP) and higher. Since the rest of this article’s code sample is decoupled from the previous example I used a new Activity. If you decide to follow on, create a new Blank Activity named RevealActivity. Make sure this activity’s layout file has a Floating Action Button, as we will utilize it to fire up our animation. In my example, this FAB has the android:id="@+id/fab". To make a reveal animation on a view you will need a layout to show after the animation is performed. The layout depends on the view you like to show in the app, but to keep it simple I built an example layout to “animate-show”. In the layouts folder create a new file, fab_reveal_layout.xml and insert the following code. Actually, the container LinearLayout in this file has a visibility attribute visibility="gone" so nothing will be visible when you insert this code in your file. To check out this layout, remove the visibility attribute from the LinearLayout or take a look at the following image. After creating this file, include it in the activity’s layout file. After including the fab layout in the Activity’s layout we need to setup the CircularReveal animation. 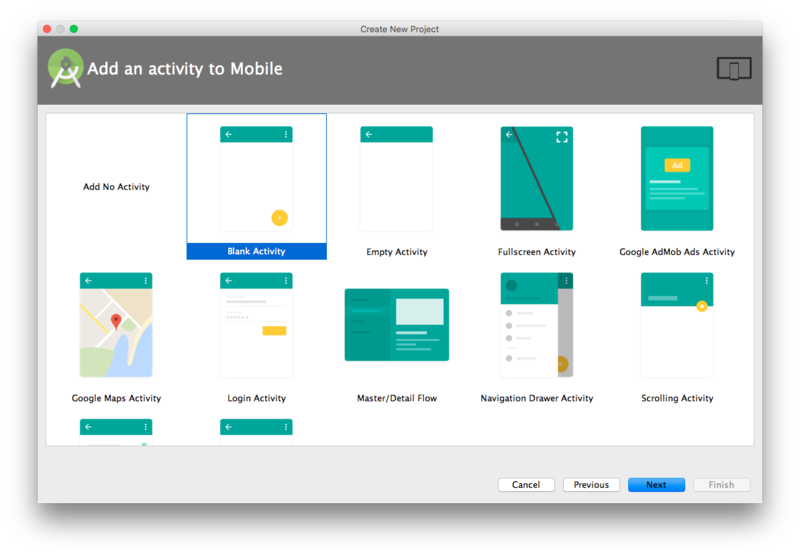 In the RevealActivity class create the following global instances of the Floating Action Button, a boolean to keep track of the animation status and the fab_reveal_layout container layout. Next, in the RevealActivity‘s onCreate() method to find the FAB’s view references and add a click listener. I only initiated the Activity’s FAB because that is all needed to fire up the animation. The toggleFabMenu() function is used create and fire up the reveal animation. Just add the following code in the RevealActivity class and I will describe in details what it does. As I mentioned earlier, the createCircularReveal() method only works on LOLLIPOP and newer Android version, so this function has a TargetApi for build version LOLLIPOP. This means this function will not be called when fired up in a pre-LOLLIPOP device. The first thing this function does is to checks whether the animation view is visible using the fabMenuOpen Boolean values. In this function, I change the image of the fab using the setImageResource() method. If you add this function in your class make sure you add the missing images in the drawable folder, or just comment out this lines of code from the function. If you run the project now it will work properly, as shown in the following GIF, but if you are interested in learning how the createCircularReveal() works check out the next section of this article. The createCircularReveal() method is used to setup the animation. It takes five parameters based on which it creates an animation on the view. The first parameter is a reference to the view that will be shown by the animating circle. The next two parameters are the X and Y coordinates of the screen where the animation will start. These coordinates are related to the view that is reveal animated. Since the animation is a circle reveal it needs the radius of the circle it is drawing, so the next two parameters are the starting and the end radius of the animation. Relating to the example of this article, as shown by the GIF the animation will start at the center of the view with a start radius of “0” and the end radius is calculated by the Math.hypot() method. To reverse the animation just change the values of the start and end radius with each other. The tricky part of the circular-reveal animation is finding the animation start coordinated related to the view that is reveal animated. For example, I calculated as the X and Y coordinates of the animation, respectively the width/2 and the height/2 of the view in order to find the center of the view to start the animation. Take a look at the following image to find out how to determine the coordinates of your own animations. I hope I’ve given you an idea of how to animate Floating Action Buttons in your own project. From here you should read Android’s Animation Resources and create your own animations for your apps. You can find the final code for this project on GitHub and I welcome any questions or comments you may have.